Drink Name and Wine Knowledge Database The Bartender Toolkit is ideal for bartenders, bar owners, managers, restaurant staff, employees, and anyone with an interest in bartending, wine knowledge, or the hospitality industry. The Bartender Toolkit is a Drink's name and wine knowledge database. 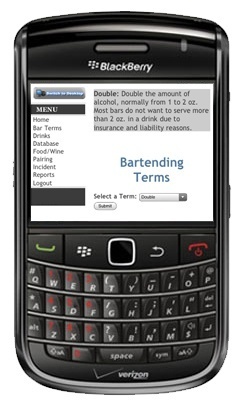 Bartending Toolkit operates on any device with access to the Internet. - ONLY $19.95 for the first one year license! - $8.99 for license renewal. Document incidents to help you protect yourself from harmful lawsuits that arose from a situation that was not your fault. Don't know a bar term? Simply look up the terms used to describe drinks in a bar.